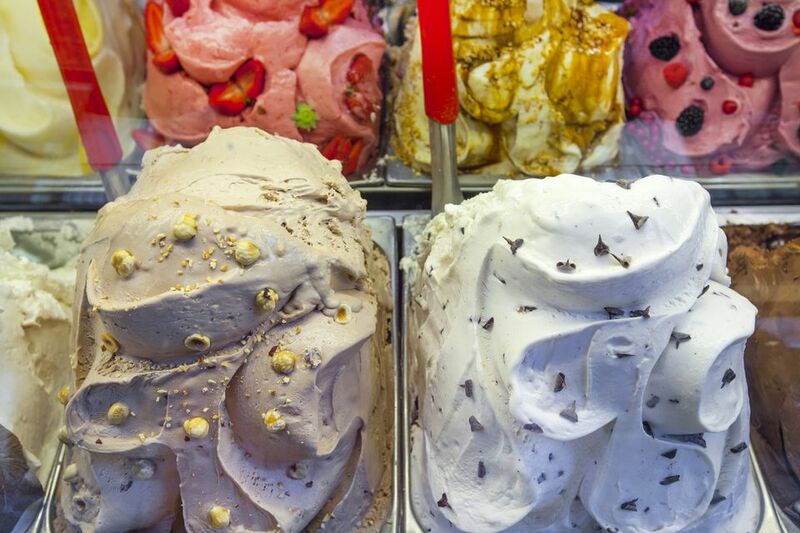 Gelato, or Italian ice cream, is a top treat in Florence, Italy. Here's where to find a good gelato shop, or gelateria, in Florence. Our team has eaten gelato at the first four and the others come highly recommended. When we met Kyle for our walk in Florence, he took us to his favorite ice cream shop, Gelateria La Carraia. They serve excellent homemade gelato in a large variety of flavors. My cone with two flavors cost one euro (2008). Gelateria La Carraia is in​ Piazza N. Sauro near Ponte Carraia, in the Oltrano area (across the river). They also have another shop, Gelateria La Carraia 2, at Via de' Benci 24/r. Kristin Stasiowski, a Context Florence walking tour guide, took me to her favorite Florence gelato shop, Gelateria dei Neri. The small shop has handmade ice cream in a variety of flavors, some of them unusual, and make sorbetto and soy-based gelato, too. My favorite was the chocolate and orange. Gelateria dei Neri is at Via dei Neri 20-22, toward the center from the river and Ponte alla Grazie. Vestri is an artisanal chocolate shop with, as you'd expect, excellent chocolate gelato. They have only a few flavors but they're very good, made the old-fashion style and kept in metal canisters rather than being on view in a glass case. Vestri is a small shop north of Piazza Santa Croce on Borgo degli Albizi 11r. L'Angolo del Gelato makes a good stop on your way into or out of Florence if you arrive by train or bus. L'Angolo del Gelato is on a corner of Piazza Santa Maria Novella so you can admire the church while eating your ice cream. It's inexpensive and they have a few interesting flavors such as my favorite, cinnamon. Venchi Chocolate has opened a combination ice cream and chocolate shop in Piazza del Mercato Nuovo, opposite the Loggia del Porcellino. Known for their high-quality artisan chocolate, their ice cream is made with all natural products without the use of any hydrogenated fats, flavorings, colorings, and ​mono-diglycerides of fatty acids. There is also an educational area detailing the history and manufacturing process of chocolate. Vivoli is highly recommended by Joe Palisi, an Italy traveler who has contributed photos to this site. He says it's his favorite gelateria and he's been there several times. Vivoli gelato is made fresh daily with natural ingredients and costs a little more than average. Vivoli is at Via Isola delle Stinche 7, about a block off Piazza Santa Croce. Gelateria Carabé is known for their Sicilian style gelato. Try the gelato panino, an ice cream sandwich made with a brioche. The gelateria is on Via Ricasoli 60R, not far from the Duomo. Learn to make pizza and gelato in this 3-hour cooking class held in a pizzeria. Dinner with wine or soft drinks is included.